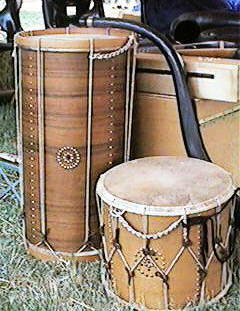 Drums (tambour, Trommel, tamburo, tambor, drome, dromme, drume), along with other percussion instruments were probably among the earliest instruments. There is evidence that the first membrane drums consisted of naturally hollow tree trunks covered at one or both ends with the skins of water animals, fish, or reptiles. Later, skins of hunted game and cattle were used. Drum bodies could be of wood, metal, earthenware, or bone. The head or heads could be fastened by glue, nails, or laced or lapped to the body of the drum. Sometimes there would be the hoop tensioned by rope. A gut snare could be added to the top or bottom head for a different effect. Numerous representations of drums in a variety of shapes and sizes appear in the art of Egypt, Southern Africa, Assyria, India, Sumaria, China, and Persia. The art of the Greeks and Romans show membrane drums. 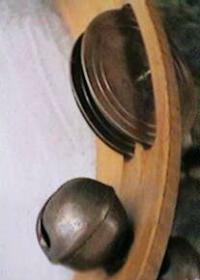 Small kettle drums (known as nakers, nakeres, nacara, nacaires) and tabors of Arabic or Saracenic origin came to Europe with the 13th century crusades. 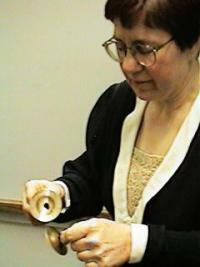 The bowls of these instruments were of wood or metal or clay, covered with a membrane. 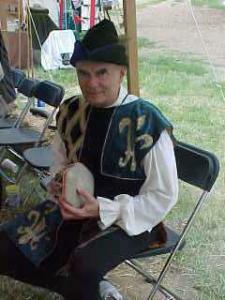 Nakers first appeared in England in the early 14th century. Chaucer mentioned them in his Knight's Tale. In 1304 Edward I's musicians included a Janino le Nakerer and in 1349 nacaires helped to celebrate the entry of Edward III into Calais. 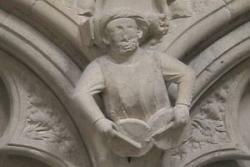 They were used in chamber music and for accompanying songs as well as in dance and processional music. The unusual rommelpost drum looks like a small naker but is not played by striking the head. Instead, the sound is generated by sliding the fingers back and forth on a slender wooden rod which is fastened to the center of the head inside the drum shell. 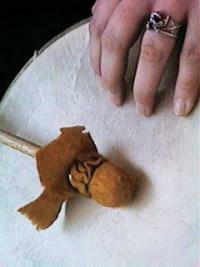 Rosin is placed on the rod to help provide friction induced sounds which are amplified by the drum head. to ones used in medieval Europe. 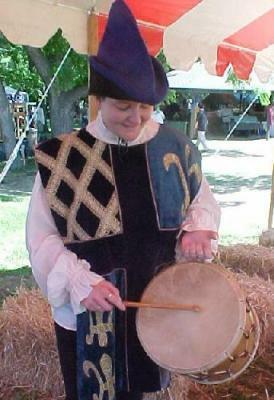 The tambourine is a single headed frame drum consisting of a shallow ring of wood covered on one side with parchment. It usually had small metal discs (sometimes bells) arranged singly or in pairs hanging loosely in openings in the shell. 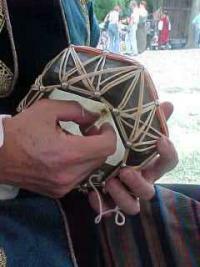 The tambourine (timbrel, tambour de Basqui, Tamburin, Schellentrommel, cimbaletto, tamburino, panderete) is believed to be of Near Eastern origin. It was found in various forms in Assyria, Egypt, China, India, Peru, Greenland, the Caucasus and Central Asia. It was used in prehistoric Britain and in Gaul, but its popularity increased with the advent of the Romans. As the Hebrew Tof, it was presumably the instrument used by Miriam and her maidens to celebrate Israel's triumph over the Egyptians. 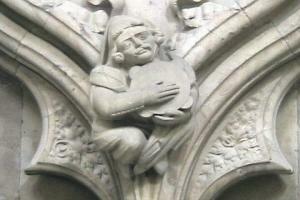 The tambourine is pictured in early art in funeral lamentations, in joyous processions and feasts, and in the hands of angels as well as rustics. It was popular throughout the Middle Ages in all parts of Europe, and was depicted at that time in a form very similar to today's tambourine. Finger cymbals (crotales, zil) have been known since antiquity, perhaps from the middle of the 1st millennium BC. They are played in pairs, sometimes one in each hand as pictured, and often in one hand, one held on the thumb and the other on either the index or middle finger. Used to accompany dances, and sometimes held by the dancers themselves, they are still used chiefly in the Islamic cultures and on the Indian subcontinent. 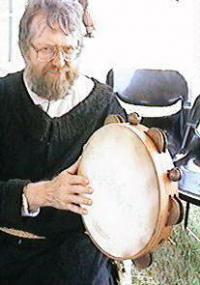 Musica Antiqua owns three drums by Williamson, a Capriol tabor, a large side drum, and a timbrel. The collection's four nakers have bowls formed by Dreeszen and laced by Hauser. Three sets of finger cymbals of various makers are used by the ensemble including a cast set by LP.